390 Hayrake Lane – This Manor home is ideally located less than 3 miles from historic Downtown Bozeman in the prestigious North Ridge Ranch subdivision. North Ridge Ranch is comprised of only 12 properties, each with a minimum of 20 acres, adjacent and to the north of Triple Tree. The property is on a gentle ridge at the end of a cul de sac off Jack Leg Road, accessed via either Trooper Trail or Wildrose. The home enjoys the complete end of the road privacy and stunning panoramic views encompassing the entire Gallatin Valley. This is Bozeman’s prime spot for sunset and stargazing, viewing Fourth of July fireworks, enjoying the resident elk herd, and watching eagles fly. The 5 bedroom, 6 bath, 5,290 square foot residence, built in 1998, has been impeccably maintained and updated. 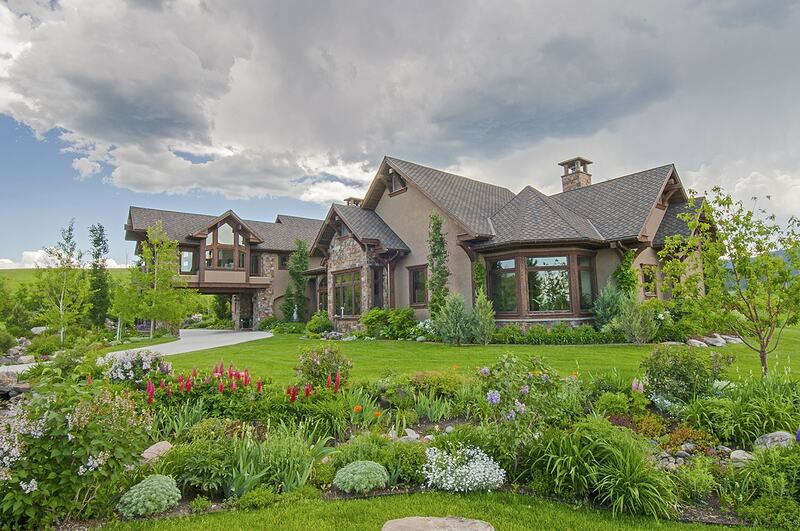 The inviting home has a style that is best described as a Montana lodge mixed with a fine English Manor. A hefty arched log spans the entrance to the jackleg fenced property and immediately alerts you to the specialness of the estate. The 23 acre property includes 3 jackleg fenced horse pastures, a 4 stall barn with paddocks, a walk in, heated and air conditioned greenhouse, and the home is bordered with well-tended landscaping consisting of lawns (with underground sprinklers), perennial beds and shrubs, vegetable gardens, and expansive entertaining decks and patios. The exterior of the impressive two story is a combination of an apron of river rock and dove gray stained batten board wide planked wood for the first floor, and honey colored shingles on the upper level. Traditional English green painted wood trim is used around windows, rooflines, and garage doors. A stone chimney ties in the stone elements, as well as adding to the sense of a well constructed and solid home. The asphalt driveway, which includes a parking area, circles to the stone walk leading to the slate stairs and wide veranda front porch. The porches overhang roof is supported with stone and timber pillars. The home’s arched front French doors are handscraped and oversized, balancing the scale of the Great Room, just beyond the foyer. Every well thoughtout detail adds to the homes integrity and harmony. The continuity of natural materials begins at the front door and carries through every room of the house. Wire brushed fir flooring is utilized through out all public areas, interior doors are wire brushed cedar, neutral colored plaster walls are accented with wood trim, and timbers define otherwise open spaces. Sited to take full advantage of the spectacular views, each room has picture windows, bathing the home in natural light. In most rooms, you are able to enjoy the views in 3 directions. The seamless merging of Inside and Outside in this home is complete due to the abundance of windows and main floor rooms having glass doors to outside decks, patios, and gardens. The front door opens to the foyer and the Great Room beyond. The awe-inspiring views from the living rooms soaring picture windows grab your immediate attention. The Bay window bump out in the living room allows for not only the prominent West facing views of the entire Valley and Tobacco Roots, but also South and North views of the Spanish Peaks, Gallatin Range, and the Bridgers. Timber framed, with a 26 high vaulted ceiling, and picture windows for the full height, the living room’s fireplace on the South wall of the Great Room, is a natural gathering place. The lodge sized wood burning fireplace has floor to ceiling river rock surround, a river rock hearth, and a log mantle. Built in book and storage cabinets flank the fireplace and house the home’s sound system. The room is grand enough for multiple seating areas for enjoying the fireplace or the Big Sky of Montana right out the windows. Seven hands scraped timber beams are used as room defining pillars, to add scale and a coziness to the space, as well as support for the open 2nd-floor breezeway, above the foyer, connecting the staircase to the South and North wings of the upper floor. The Great Room, consisting of the living room with its 26 high ceiling, and the dining and kitchen areas with 10 ceilings, is a circular floor plan, great for accommodating large crowds. The layout allows for intimate dinners or big parties, with choices of where to dine and how to serve. The kitchen is definitely command central for the Great Room and has more than enough room to accommodate multiple chefs. With two kitchen islands, bar seating, and an appliance package to suit the most discerning chef, the country style kitchen and adjacent walk in pantry, is loaded with storage and counter spaces. A 6 burner with griddle, 2 oven Viking Range is set into its own kitchen nook with Travertine marble walls and an artistic backsplash tile of a rooster. The C-shaped main granite work counter has a corner sink with large windows, a mosaic marble tile backsplash, and wood edging trim. The refrigerator is built in and the Miele Dishwasher is new. The numerous cabinets are custom knotty pine. The main kitchen island has a butcher block work area with a hammered nickel bar sink and raised graniteâ topped bar seating area. The cabinets are rubbed and distressedâ painted white. The second kitchen island serves as a divider between the kitchen and dining room, running the length of both. It features glass-fronted, pass through, overhead cabinets. The large granite counter beneath the cabinets is suitable for buffets and includes additional bar seating on the dining room side, along with banks of drawers and cabinets. There is also a warming drawer and ice maker. The breakfast room / casual dining area, on the North side of the kitchen, serves as a sitting room as well as a dining area, with bookshelves and big windows facing the Bridger Mountains. A gas fireplace is set in a Travertine marble nook, mirroring the nook for the Viking Range, with an art tile of a boar. Beside the breakfast room and formal dining area is an outside covered entertaining deck. You’ll enjoy many months of the year dining outdoors in this semi enclosed, heated deck with its Ipe (Brazilian hardwood) flooring and terrific sound system. The deck takes in views of the entire sweep of Bridger Mountains to the North and the whole Valley, Spanish Peaks, and the Gallatin Range. The deck continues beyond the eating area to the lawns and dramatic stone pillar waterfall with its 300(+) gallon pond. Outside entertaining areas include brick walkways and porches set apart with artistic metal railings created by noted artisan Doug Adelman. The South wing of the home, off the Great Room, includes the Master Suite, an office, and the powder room. The Master, entered through a door flanked with 2 of the 7 living room timbers, is carpeted and very generously sized. A gas fireplace is set in deep moss green marble. Semi built in wood cabinets and shelves are beside the fireplace. The room has glass doors to the West facing deck with built in hot tub and the expanse of lawns. The bedroom’s walls are painted in Ralph Lauren suede in muted buckskin sand and sage green tones. Arched doorways and openings are used in numerous places throughout the home, softening the architecture. The entrance from the Master bedroom to the dressing foyer and bath is one of these appealing wide arched openings. The foyer area includes a built in chest of drawers. There is an arched opening to the walk in closet. The Master bath is spacious and refined, with touches such as a chandelier suitable for a dining room and rich wood finishes. The room has marble flooring and accent insets of marble mosaic tiles. The marble topped vanity includes dual sinks and custom wood cabinets. The bathtub has a wood fronted deck matching the cabinets, while the extra large shower has an arched stone entry with marble tiles. West and South windows allow plenty of natural light into the space. The main floor office, with its wire brushed fir flooring, is located by the front foyer. The ultra private office includes builtâ€in wood cabinets and library shelves, a pitched tongue and groove wood ceiling, and a sliding glass door to the stove brick South patio. The room enjoys North, East, and South facing windows trimmed with wood, while the walls are soft terracotta suede paint. The charming powder room, across from the office, has a wainscot of wood with the upper walls in a padded fabric inspired by an English floral crewel embroidery motif. The vanity, in an aged green wood, is topped with a copper sink and has an old fashioned copper fixture. The upper floor of the home is accessed by the carpeted staircase near the front foyer. An office and sitting area is at the top of the stairs, with an opening to the living room below. Timber and beam work provides a lodge feeling to this area that leads to the two bedrooms on the South wing of the home. Each of these carpeted Junior Suites are spacious, and enjoy excellent views from multiple windows, have ample closets with storage, and private full baths with finish levels commiserate with the entire home. The North wing of the upper floor begins with an enormous media/family room. This is where you curl up on a sofa and enjoy the big screen. Along with the carpeted media area, there is a wet bar with bar seating, marble counters, a beverage refrigerator, and wine cooler. A game table/sitting area has big picture windows and a glass door to the private deck, ideal for sunbathing, cocktails, or enjoying nature and Bridger Mountain scenery. A hallway from the bar area leads to two bedroom suites and a small office with a Bridger Mountain view. The first bedroom, now used as an exercise room, has Bridger views, a walk-in closet, wood floors, and a bathroom with a glass fronted shower and porcelain tile flooring and vanity. The second bedroom, at the end of the hall, is a very private suite with big East facing views as well as North and South views. Carpeted, and quite spacious, this is an ideal guest room. The charming bathroom, with a wood floor and a glass fronted shower bath have many touches. The laundry, mud room, and walk-in pantry are on the main floor between the kitchen and the extra large attached 3 car (big trucks!) garage. The pantry ensures you can make all the trips you want to Costco as there is storage, storage, and more storage, with built in open shelving, an expanse of counter tops, and a built-in GE Microwave/convection oven. The laundry and mud room also serve as a catering kitchen with a back up Whirlpool dishwasher, Maytag washer and dryer, deep utility sink, lots of counter space, and yet more storage areas. Going from the mud room into the garage, there is another staging area for boots, coats, and gear, as well as a backup refrigerator. The heated garage is a Man Cave with a sound system and speakers worthy of a dance parlor. The garage doors have upper windows. There is a door with a doggie doors opening to a fenced in dog kennel area. Three storage rooms in the garage allow for organized areas for all the toys and gear one accumulates in Montana. There is central vac, a tool and workshop room with a utility sink, and a locked door fireproof room with a safe. The 4 stall barn with a heated tack room, is a short walk from the home. There’s a hayloft space with an exterior door and individual paddocks from each stall. Each stall contains an automated and heated waterer. A heated chicken coop is just around the corner. The greenhouse is dressed up with a river rock stone apron to match the home’s facÌ§ade. Metal framing is tall enough for a central walkway. The automated vents and air conditioning keep the sun-drenched greenhouse cool during the summer, while the automated heater means gardening is possible the entire year. The home is in move-in condition and priced to sell. View the 390 Hayrake Lane Listing HERE.